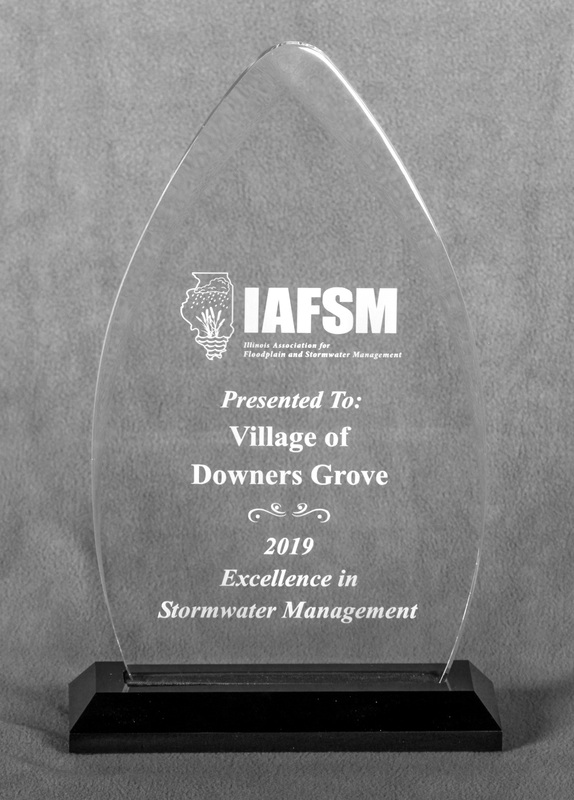 The Village of Downers Grove has been recognized for "Excellence in Stormwater Management" by the Illinois Association for Floodplain & Stormwater Management (IAFSM). Mayor Tully and Public Works Director Nan Newlon were presented the award by Sarah Hunn, IAFSM Board Member and Deputy Director of DuPage County Stormwater Management at the March 19, 2019 Village Council meeting. "While we certainly have more work to do in this area, it is gratifying to know that outside organizations recognize the significant strides the Village has made over the years in terms of creatively addressing and funding meaningful solutions to chronic stormwater challenges facing our community." Mayor Tully said. Congratulations Downers Grove and many thanks to the Public Works Department for all their efforts to make it possible.